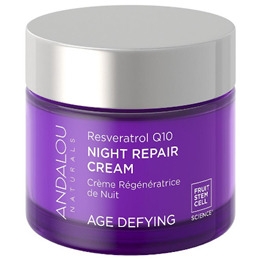 Fruit stem cell complex, resveratrol, and CoQ10 create antioxidants to stimulate circulation, slow cellular damage, and speed healthy cell renewal for improved dermal texture, diminishing fine lines and wrinkles for smooth, ageless beauty. Aloe Barbadensis Juice*, Vegetable Glycerin, Theobroma Cacao (Cocoa) Butter*, Helianthus Annuus (Sunflower) Oil*, Lauric Acid, Cetearyl Alcohol, Ethylhexyl Palmitate, Fruit Stem Cells (Malus Domestica, Solar Vitis) and BioActive 8 Berry Complex*, Resveratrol, Ubiquinone (CoQ10), Magnesium Ascorbyl Phosphate (Vitamin C), Hydrolyzed Wheat and Hydrolyzed Soy Proteins, Lycium Barbarum (Goji) Glycopeptide, Fagus Sylvatica (Beech) Extract, Tocopherol (Vitamin E), Linum Usitatissimum (Flax) Oil*, Hyaluronic Acid, Borago Officinalis (Borage), Persea Gratissima (Avocado), Rosa Canina (Rosehip) and Oenothera Biennis (Evening Primrose) Oils*, Olive Squalane, Camellia Sinensis (White Tea), Aspalathus Linearis (Rooibos) and Hibiscus Sabdariffa Extracts*^, Allantoin, Mangifera Indica (Mango) Butter, Phenethyl Alcohol, Ethylhexylglycerin, Symphytum Officinale (Comfrey) Extract* Non-GMO verified *Organic ^Fair Trade. 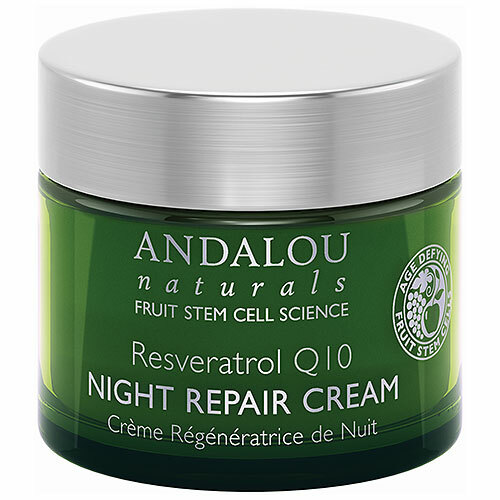 Below are reviews of Andalou Resveratrol Q10 Night Repair Cream - 50ml by bodykind customers. If you have tried this product we'd love to hear what you think so please leave a review. Helps to stimulate circulation, slow cellular damage, and speed healthy cell renewal for improved dermal texture, diminishing fine lines and wrinkles for smooth, ageless beauty.